Typically, an unbundled product is designed to be installed in a unique location. This product is composed of binaries, shared object dependencies, and associated configuration files. For example, the unbundled product ABC might have the layout shown in the following figure. Assume that the product is designed for installation under /opt. Normally, you would augment your PATH with /opt/ABC/bin to locate the product's binaries. Each binary locates their dependencies using a hard-coded runpath within the binary. For the application abc, this runpath would be as follows. Similarly, for the dependency libA.so.1 the runpath would be as follows. This dependency representation works until the product is installed in some directory other than the recommended default. The dynamic token $ORIGIN expands to the directory in which an object originated. This token is available for filters, runpath, or dependency definitions. Use this technology to redefine the unbundled application to locate its dependencies in terms of $ORIGIN. The dependency libA.so.1 can also be defined in terms of $ORIGIN. If this product is now installed under /usr/local/ABC and your PATH is augmented with /usr/local/ABC/bin, invocation of the application abc result in a path name lookup for its dependencies as follows. Note - Objects that contain a $ORIGIN token can be referenced using a symbolic link. In this case, the symbolic link is fully resolved in order to determine the true origin of the object. Another issue related to dependency location is how to establish a model whereby unbundled products express dependencies between themselves. For example, the unbundled product XYZ might have dependencies on the product ABC. This dependency can be established by a host package installation script. This script generates a symbolic link to the installation point of the ABC product, as shown in the following figure. 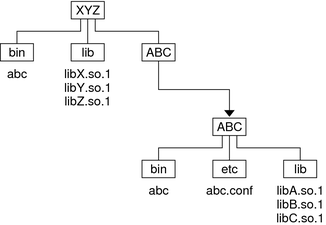 The binaries and shared objects of the XYZ product can represent their dependencies on the ABC product using the symbolic link. This link is now a stable reference point. For the application xyz, this runpath would be as follows. and similarly for the dependency libX.so.1 this runpath would be as follows. If this product is now installed under /usr/local/XYZ, its post-install script would be required to establish a symbolic link. If your PATH is augmented with /usr/local/XYZ/bin, then invocation of the application xyz results in a path name lookup for its dependencies as follows. Note - An objects origin can be obtained at runtime using dlinfo(3C) together with the RTLD_DI_ORIGIN flag. This origin path can be used to access additional files from the associated product hierarchy. In a secure process, the expansion of the $ORIGIN string is allowed only if it expands to a trusted directory. The occurrence of other relative path names, poses a security risk. A path like $ORIGIN/../lib apparently points to a fixed location, fixed by the location of the executable. However, the location is not actually fixed. A writable directory in the same file system could exploit a secure program that uses $ORIGIN. The following example shows this possible security breach if $ORIGIN was arbitrarily expanded within a secure process. You can use the utility crle(1) to specify trusted directories that enable secure applications to use $ORIGIN. Administrators who use this technique should ensure that the target directories are suitably protected from malicious intrusion.